(Jan 1, 2015) Long Island, New York. 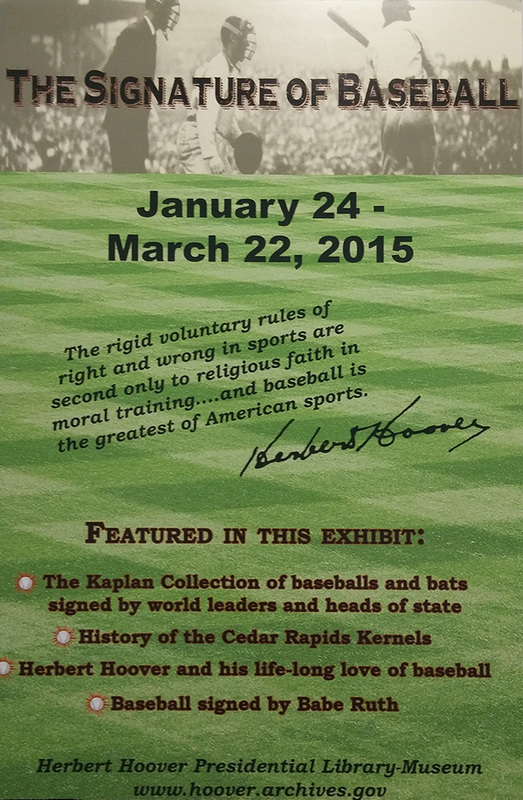 — The Herbert Hoover Presidential Library and Museum in West Branch, Iowa is pleased to announce that from January 24, 2015 through March 22, 2015, it will be exhibiting the internationally recognized Randy L. Kaplan Collection of autographed baseballs from world leaders and heads of state. 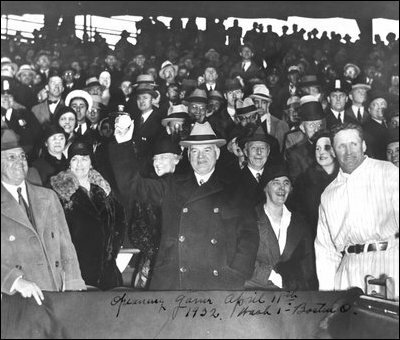 In honor of President Herbert Hoover’s love for the game of baseball, this exhibit, “The Signature of Baseball,” will include over 180 signed Rawlings Official Major League Baseball (MLB) baseballs from The Kaplan Collection including leaders, both past and present, from all over the globe, including the late South African President Nelson Mandela, former leaders Mikhail Gorbachev and Margaret Thatcher as well as the nation’s sitting President Barack Obama. Also to be exhibited will be signed Louisville Slugger baseball bats from Presidents Jimmy Carter; George H.W. Bush; Bill Clinton and George W. Bush as well as Hillary Rodham Clinton. 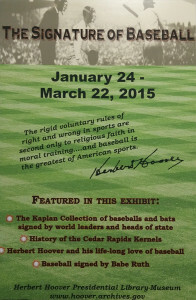 The exhibit will also feature baseball memorabilia of Herbert Hoover and relics of past baseball heroes and local legends. 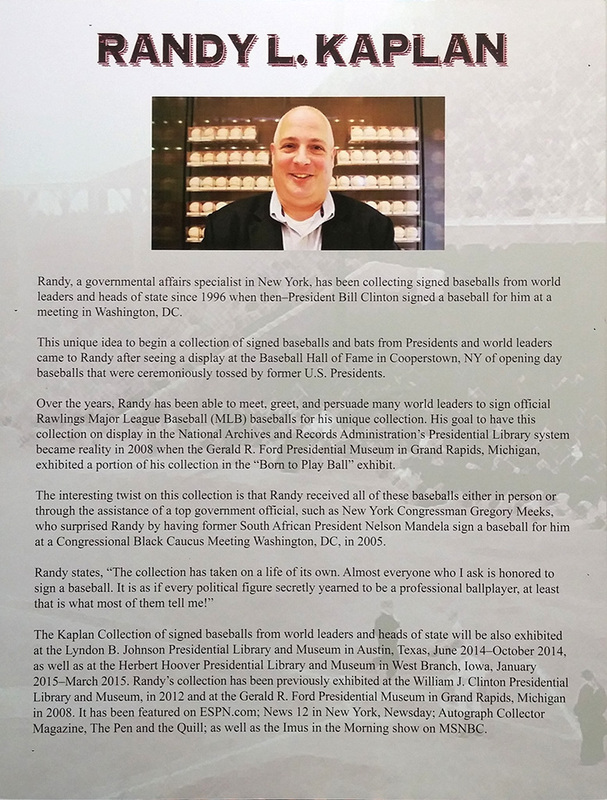 Randy, who is a governmental affairs specialist in New York, has been collecting signed baseballs from world leaders and heads of state since 1996 when then President Bill Clinton signed a baseball for him at a meeting in Washington, D.C.
Over the years Randy has been able to meet, greet and persuade many world leaders to sign official Rawlings Major League baseballs for his unique collection. His goal to have this collection on display in the National Archives and Records Administration’s Presidential Library system became reality in 2008 when the Gerald R. Ford Presidential Museum in Grand Rapids, Michigan, exhibited a portion of his collection in the “Born to Play Ball” exhibit. 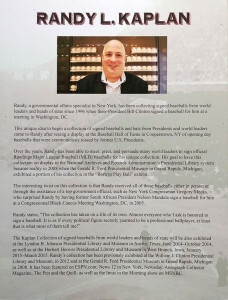 The interesting twist on this collection is that all of these baseballs were received in person by Randy or obtained through the assistance of a top government official such as NY Congressman Gregory Meeks who surprised Randy by having former South African President Nelson Mandela sign a baseball for him at a Congressional Black Caucus Meeting Washington, D.C. in 2005. Randy’s collection was recently exhibited at: the Lyndon B. Johnson Presidential Library and Museum in Austin, Texas; the Richard Nixon Presidential Library and Museum in Yorba Linda, California; the William Jefferson Clinton Presidential Center in Little Rock, Arkansas in 2012 and at the Gerald R. Ford Presidential Library and Museum in Grand Rapids, Michigan in 2008. The collection has been featured on: Fox TV’s “Good Day Austin” Show in Texas; ESPN.com (Grantland); the BBC News Network; KXAN TV in Austin; News 12 Long Island; Newsday; Elis Hennican’s Column; The San Antonio Express News; The Daily Texan; The Jordana Green Show on WCCO 830 AM in Minneapolis; Autograph Magazine; The Pen & the Quill as well as on the Imus in the Morning Show on MSNBC.